Caring for skin that is dry is as tough as caring for skin that is oily. For the latter, it is the constant blotting with tissues issue, whereas, for the former one, it is the continuous application of moisturizer. SEE: 4 Home Remedies to Help You Get Rid of Dry and Flaky Skin. There are a lot of concerns associated with dry skin, such as flaky, itchy, and sensitive skin. However, with proper care, you can tackle these problems. 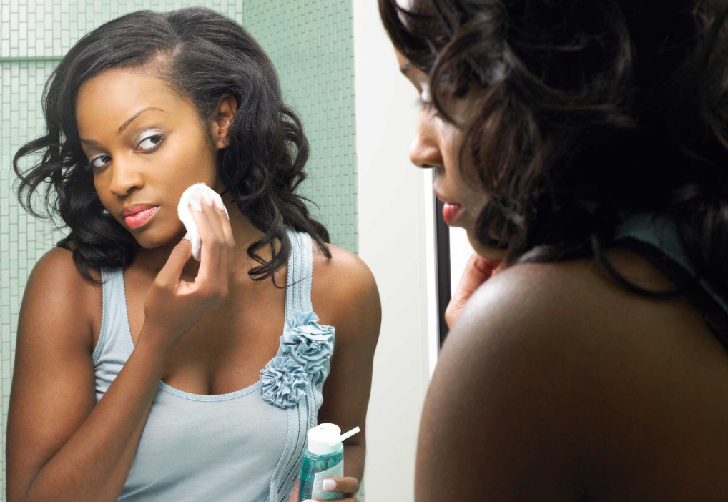 Following a consistent daily skin care routine is the trick to achieving moisturized and dewy skin. Here’s what you need to do every morning to achieve that. ⏩The first thing you need to do as soon as you get up is to splash your face with cool water a few times. This makes your skin feel completely refreshed. ⏩Then, pick a moisturizing cleanser and gently cleanse your face with it. Make sure you choose a natural product with minimum chemicals. ⏩After that, tone your skin. Pick a toner that is not drying. Rose water is a good and natural option that you can try. ⏩The next step is moisturizing – the most important one. Apply the moisturizer thoroughly all over your skin until it gets completely absorbed. ⏩Then, it is time for the sunscreen. If you are stepping out, ensure that it has an SPF of 30 or more. Reapply every few hours. ⏩If you want to use makeup, then it is best to go light. Tinted moisturizers, bb creams, and concealers are good options. Make sure they are moisturizing too to prevent any dry patches.